This is all simply fascinating for so many reasons. One quick question regarding potential plagiarism in the Wolfe book: You've provided a side-by-side of your material vs. Wolfe's; is it possible to also show the root material from Douglas’ “The Cases That Haunt Us"? I would assume that Wolfe could say that he used the same source material as you did, so his prose matched yours. Also - why would he have to PAY ("he paid big bucks to Douglas’ publisher for use of that material") to use factual material in a nonfiction book? Why not simply cite the material clearly? Quick, Watson, into the time machine! Holmes! That means your article appeared before John Douglas' book! The material in the article is based on my interview with John Douglas, conducted in 1996. Douglas (who collaborated with co-author Mark Olshaker) really had no knowledge of the Black Dahlia case until I told him about it. Note that this material doesn't appear in "Cases That Haunt Us." Just my article, which I subsequently put on my website in the "director's cut." For example, the phrase "was comfortable wallowing in blood" cannot be found in "Cases That Haunt Us" (use amazon's "search inside" feature to see for yourself). But it occurs in my 1997 story AND "Black Dahlia Files." As for paying big bucks, that's a question for Donald H. Wolfe. I still would like some more Dillon stuff worked out. Like was he ever really a suspect? I had to treat Dillon somewhat briefly as he's a bizarre diversion from the Black Dahlia investigation. Was he a suspect? Absolutely, at least as far as Joseph Paul de River was concerned. I'm not sure Harry Hansen and Finis Brown ever took him particularly seriously. Nonetheless, investigators spent oceans of time eliminating him. 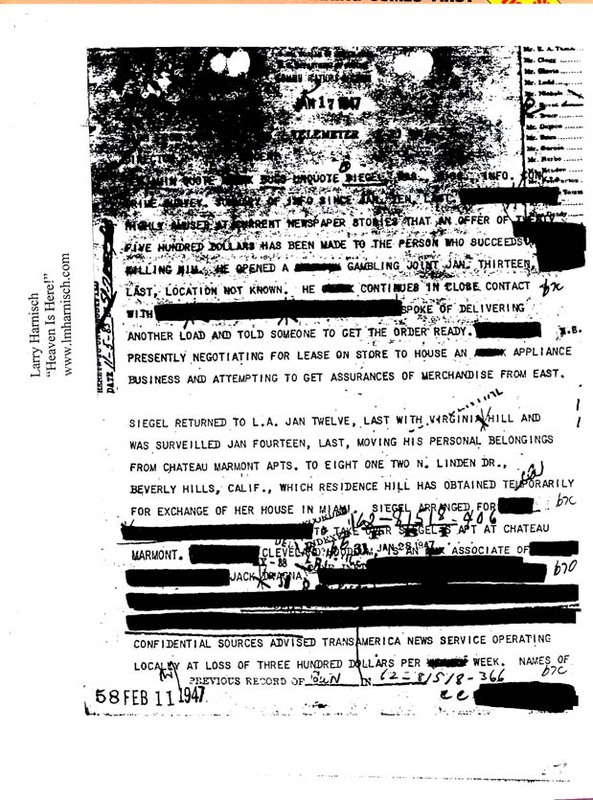 What finally did the trick was locating a receipt Dillon signed from a garage sale up in San Francisco in close proximity to when Elizabeth Short was killed. Investigators talked to all sorts of people in San Francisco to eliminate him as a suspect. It truly was an exhaustive investigation, in my opinion. If I get more time I'll go back and pick up some of the Dillon stuff. It's quite a story. But, unfortunately, a real diversion from the main story, which is the murder of Elizabeth Short. Ahhh! The Douglas book appears AFTER your LA Times article. Elementary. No "Search Inside" option for his book on Amazon, alas. I'm guessing Wolfe took it from Douglas's book, and Douglas failed to credit your previous version. That's me being optimistic. As for the rest (especially the alleged pasted-together memo), I remain fascinated. Actually, you guessed incorrectly. Amazon doesn't let you "search inside" on the hardback version of "Cases That Haunt Us" but offers it on the paperback version. Do a search for the key phrase "wallowing in blood" or just "wallowing," which is found in my Los Angeles Times article and in the Wolfe book, but not in "Cases That Haunt Us." RE Amazon "Search Inside": A GREAT feature, but sometimes inexplicably inaccessable (as when I tried it unsuccessfully on all editions of "Cases That Haunt Us," only to have it work with your link). 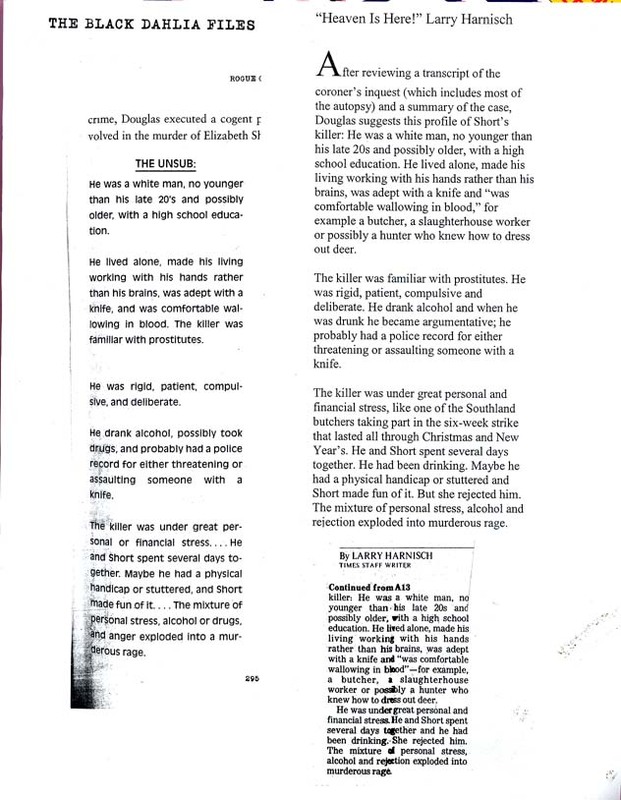 Thanks to your link I was able to confirm that, at least via "Search Inside," there is nothing in Douglas's "Cases That Haunt Us" that is like the material Wolfe uses in his book; i.e. I see some of the material in the narrative, but not in "list" format like in your pieces. I will most certainly search out a physical copy of the book to confirm, but as of now it seems like Wolfe paraphrased your material without the slightest attribution. Still troubling: He "paid big bucks to Douglas’ publisher for use of that material." That's nonsensical. Proper citation is all that's required. I hope you'll consider creating a central repository web page for your material regarding Wolfe's book so it can be seen in list format and more readily appreciated in context. This is an important issue for all writers of nonfiction, and the fact that Wolfe's book is published by a major imprint makes it all the more vital that these issues are brought to light. FYI: The very first day that Amazon's "Search Inside" feature became available, I used it to spot two instances of my material being used without citation or attribution by a single publisher. I was able to extract a nominal payment and corrections in future editions. I am the person who Donald Wolfe told that he, or his publishers (I believe he said "we") had paid for the use of material ostensibly from Douglas' book. He also said he personally liked Larry Harnisch, and if it turned out by some oversight that he had used Larry's material without attribution, that he would be extending an apology. I promptly suggested that he should also get any money he paid Douglas' publishers and give it to Larry! As far as I know, Larry is still waiting for the apology and the cash. So if you have enjoyed this blog, please make your Amazon purchases through his links. You don't even have to buy the items he highlights, just click one and search for what you want, and Larry will get a cut of the purchase price. Also, send cookies.